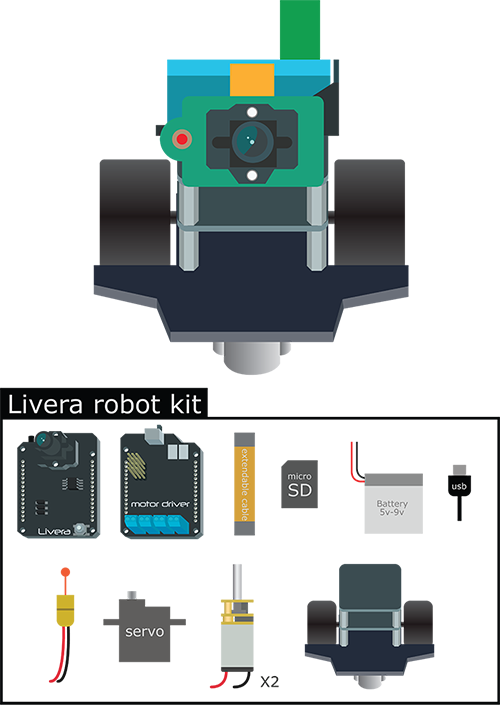 Like the picture shows, the Livera Robot kit ccomes with several conponents that you need you assemble and make it to a fully functional robot. 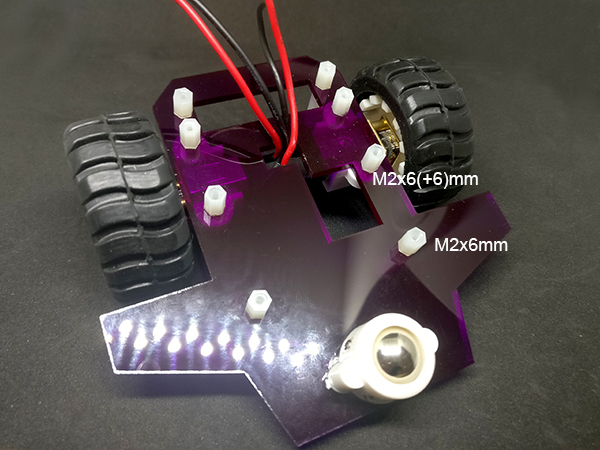 This toturial would get you through all the process of physical building and wiring, it might take around 25 minutes to make the robot alive. 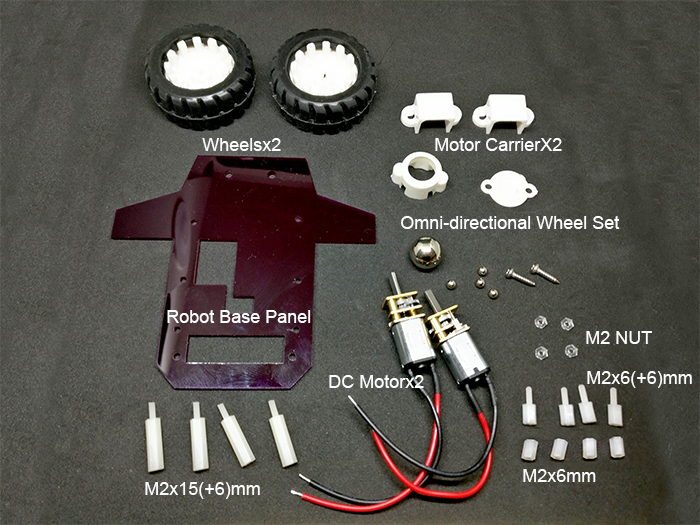 Clear up your desk, unpack the Robot kit and let begin the journey. 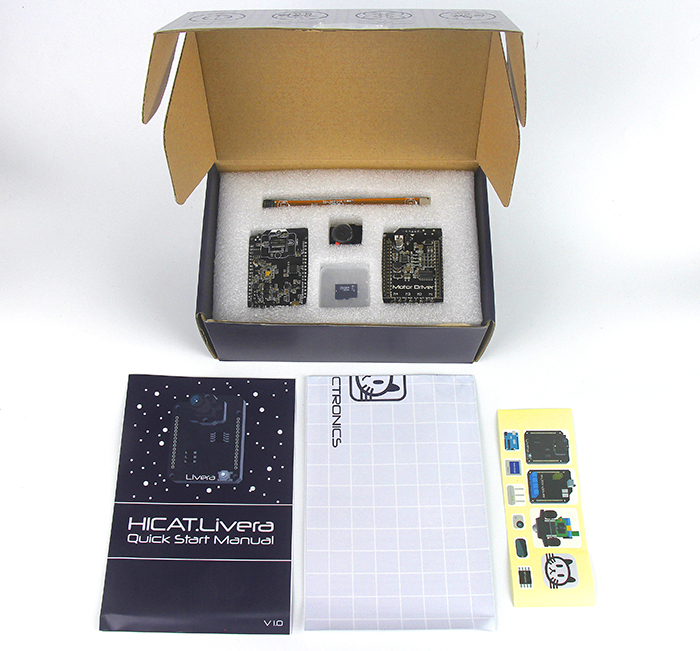 Unpack the Livera Robot kit package, Find out the following conponents in order to build the base panel of the Robot. Notice: All the Stud could be install by hand, doesn't require and tools. Caution: Don't make it too tight while screwing with the Livera and Livera Motor Driver, might have a small chance to cause damage to the board if you screw it too hard. 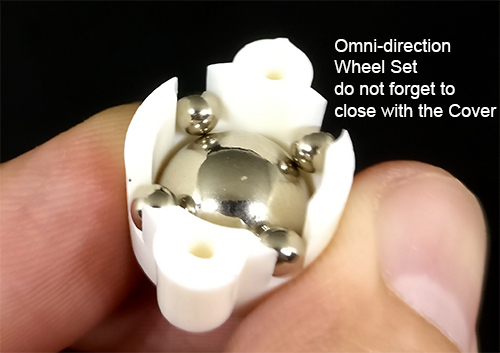 Assemble up the Omni-direction Wheel Set like the picture shows, then close up with the Cover bit, waiting for screw on the Base Panel. 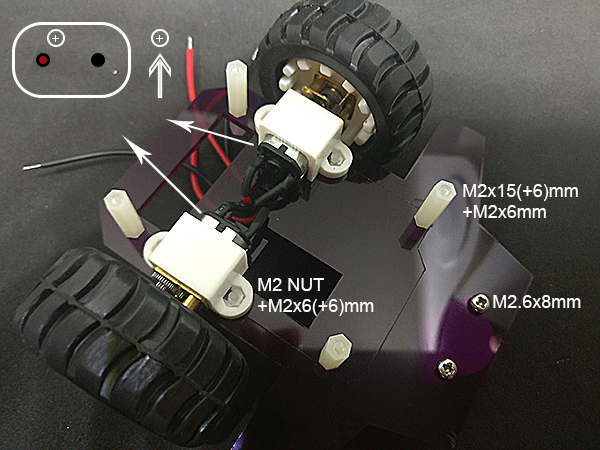 Install the motor on base panel: carefully place the M2 Nut onto the Motor Carrier's slot, than catch the DC Motor and match to the hole on the Base Panle, notice to keep the + sign on top as the left top of the pic shows, using M2x6(+6) Stud to screw through from the other side of the panel. Install the Structure bit: place the M2x15(+6) Stud on top of the Base panel, then let the 6mm screw bit through the hole and screw into the M2x6mm Stud. Install the Livera Motor Driver: simply place by matching to the Stud. Install the Structure bit: Screw M2x10(+6)mm Stud on top. 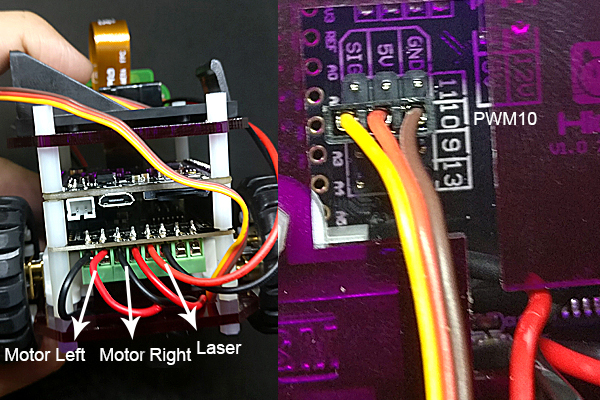 Caution: Don't make it too tight while screwing with the Livera and Livera Motor Driver, might have a small chance to cause damage to the board if you screw it too hard. Install HICAT.Livera with Extend Cable: carefully stack Livera on top of Livera Motor Driver, do check for the I/O ports and the outline to see weather it is matched to the Livera Motor Driver. Install the Structure bit: Screw M2x10(+6)mm Stud on top of Livera. Install the top Acrylic Panel: place the Top Acrylic Panel, fix the panle by screw the M2x6(+6)mm Stud on top. 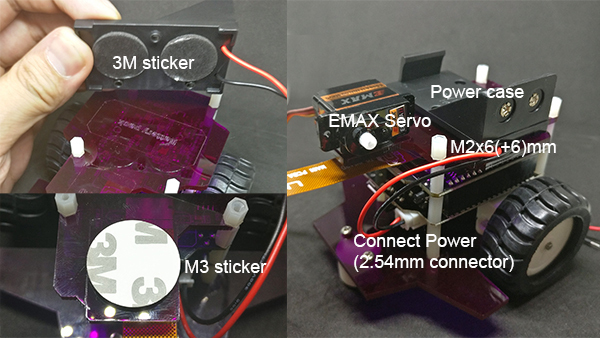 Stick the Power case and Servo: unpack the 3M Sticker, stick the conponents as the image shows. Connect Power: connect the 2.54mm Power connector from Power case to Livera Motor Driver. 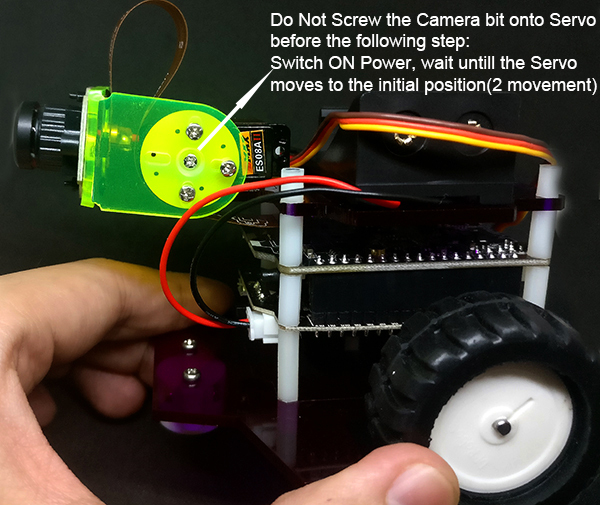 Install the Camera pan-tilt: screw the Servo Arm Set form the EMAX Servo set on the Camera Pan-tilt. 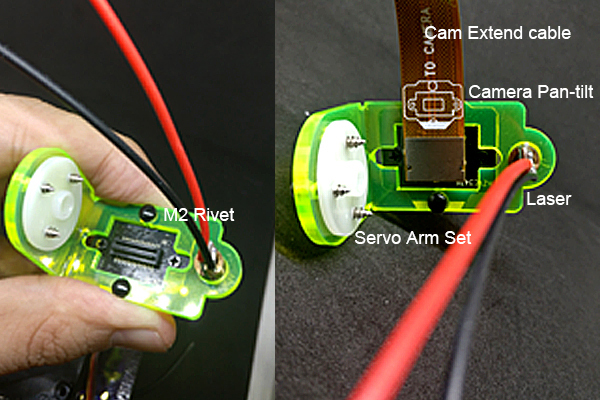 Install Camera Module: carefully place the camera module on the Acrylic Camera Pan-tilt, using M2 Rivet to fix it. 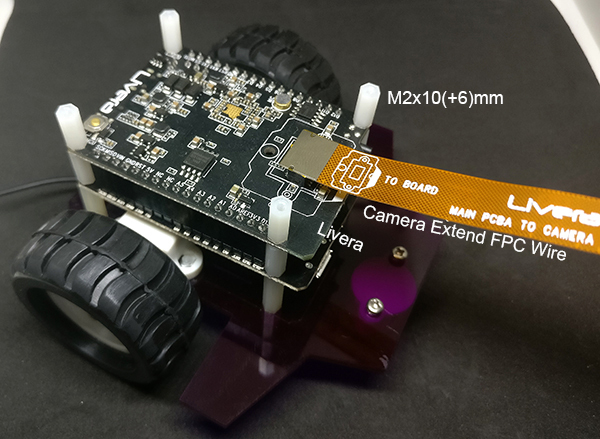 Install Camera Extend Cable and Laser Bean: install the conponents as the picture shows, notice that the direction of the camera module should be match together according to the indicate drawings. Wiring: wire up all the electronics(Motors, Laser, Servo) as the picture shows, for the DC Motor wring, you would need to use the screwdriver to fix the wire into the adapter. Install SD card: put the SD card into the SD slot. Install Battery: put the 9v chargable battery into the Power Case. Power up to init the Servo: switch on the Power Switch From the Motor Driver, wait until heard two movement from the Servo, then put the Camera Pan-tilt on the Servo in a horizon direction, screw it up using the smallest screw from the Servo Box. Switch the top video switcher to MJPG MODE, click LiveView, if the image flipped, you could change it within QUALITY, we suggest you to chose 240p/15fps. 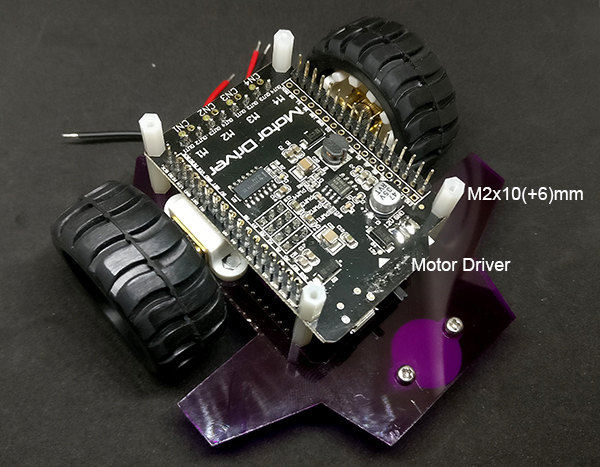 Click ROBOT to open the control panel, Try press forward button, if you see the robot spinning or move back, you could adjust the wiring by switch the DC motor wire from the adapter.